Denver’s newest and largest hotel is a visual stunner. The 519-room Westin, an example of Starwood Hotels & Resorts’ upper-upscale brand, opened last November and is a glass-clad structure shaped like the wings of a bird. 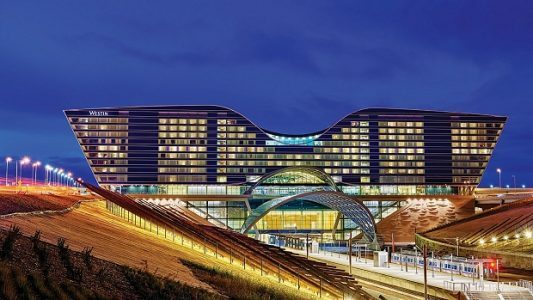 It offers guests floor-to-ceiling windows with panoramic views to the west of the Rocky Mountains, and is located on the grounds of the Denver Airport, just steps from the Jeppesen Terminal. A recent trend has been for hoteliers to make airports a place where passengers might want to spend a good chunk of the day — or multiple days, for that matter — exploring the facility’s architecture, retail shops and restaurants. Such facilities also offer a unique selling point for members of the group-business sector who are strapped for time. On-site airport meeting facilities can reduce the number of nights required to stay and in some cases, allow for day trips instead of overnight stays. Moreover, these properties are becoming more convenient because of an improving transportation infrastructure that better connects the airports to the cities they serve. Travel Weekly recently took an extensive look at some of the most exceptional airport hotels. To read more, click here.